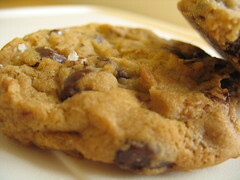 Author planet1Posted on July 23, 2008 Categories Baking5 Comments on Perfect Chocolate Chip Cookies? 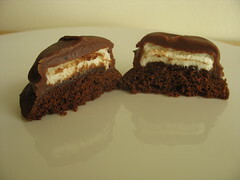 This is another recipe from Martha Stewart’s Cookies , the recipes have been consistently solid. They are listed as wreaths but I modified them for a flower design and added red, white, and blue sprinkles for the 4th of July. 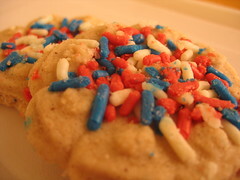 I jokingly re-dubbed them “freedom cookies” in honor of all the food that was misguidedly renamed. I halved the recipe and this made 28 cookies. 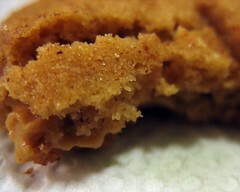 I increased the amount of cinnamon in the cookie since I didn’t sprinkle any sugar/cinnamon on top. I also substituted vanilla bean paste for the beans, it gave the same appearance with the black flecks. These were easy to make and simple and could easily be colored for any occasion. 1. Preheat oven to 350F. Whisk together flour, salt, and 1 teaspoon cinnamon. 2.Beat vanilla seeds and 1 cup sugar with a mixer on medium speed until incorporated, about 3 minutes (sugar will clump together slightly). Add butter, and beat until pale and fluffy. Add egg yolks, 1 at a time, beating well after each addition. Reduce speed to low. Add flour mixture, and beat just until smooth. 3. Divide dought into 3 portions. Pack 1 portion into a cookies press fitted with wreath disk (cover remaining portions with an inverted bol or refirgerate in an airtight container for up to 3 days; bring to room temperature before using), and press shapes about 2 inches apart onto baking sheets. Bake until edges are just golden, 9 to 12 minutes. 4. Meanwhile, combine remaining 2 teaspoons cinnamon with remaining 4 teaspoons sugar. Sprinkle over hot cookies. Let cool on sheets on wire racks. Repeat. Cookies can be stored in a single layer in airtight containers at room temperature up to 4 days. This recipe is from Baking Bites, who was inspired by the pize-winning Pillsbury Bake-Off recipe. This was a little time consuming for a cookie recipe, with the rolling of the filling and the final cookies, after the dough had been chilled. I didn’t portion the filling as well as I should have and I wound up with some leftover and I could tell that the cookies would have been better with a little more filling. This was good, but probably not a classic. I even broke my nut choper with recipe – the tines somehow become bent and no longer slide easily through the slots. I didn’t think peantus were tough nuts! I would probably just be lazy and make a regular peanut butter cookie (or my peanut butter cookie press version) instead of these. I might use the peanut butter filling in a chocolate cookie.